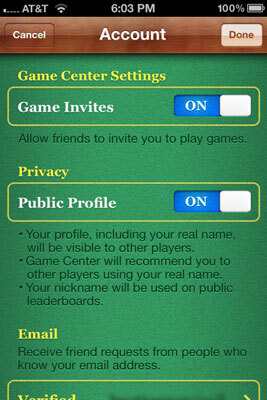 When you are opening a Game Center account on your iPhone 4S, you can create your profile and specify some account settings in the final dialog box that appears. You can also make most of these settings after you’ve created your account. 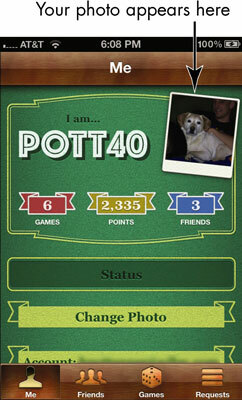 1Tap your Account name on the Game Center home screen and then tap View Account. The Create Profile dialog (Account dialog for an existing account) appears. 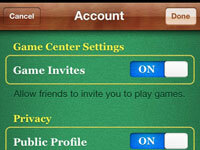 2if you don’t want other players to be able to invite you to play games when Game Center is open, tap the Game Invites On/Off button to turn off the feature. If you don’t want other players to be able to see your real name, tap the Public Profile On/Off button to turn this feature off. 3If you want your friends to be able to send you requests for playing games via e-mail, check to see if the e-mail address listed in this dialog is the one you want them to use. If not, tap Add Another Email and enter another e-mail address. 4In the Nickname field, enter the handle you want to be known by when playing games. 5To add a picture to your profile, tap Change Photo. The two options of Take Photo or Choose Photo appear. 6Tap Choose Photo to select a photo from your camera roll or a photo library. Tap the library you want to use, and scroll to locate the photo. 7Tap the photo, and it appears in a Choose Photo dialog. You can use your finger to move the photo around or scale it, and then tap Use. 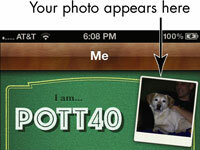 The photo now appears on your Game Center home screen. After you create an account and a profile, whenever you go to the Game Center, you log in by entering your e-mail address and password and then tapping Sign In. You can change account settings from the Game Center home screen: Tap your account name and then View Account, make changes to your settings, and then tap Done.